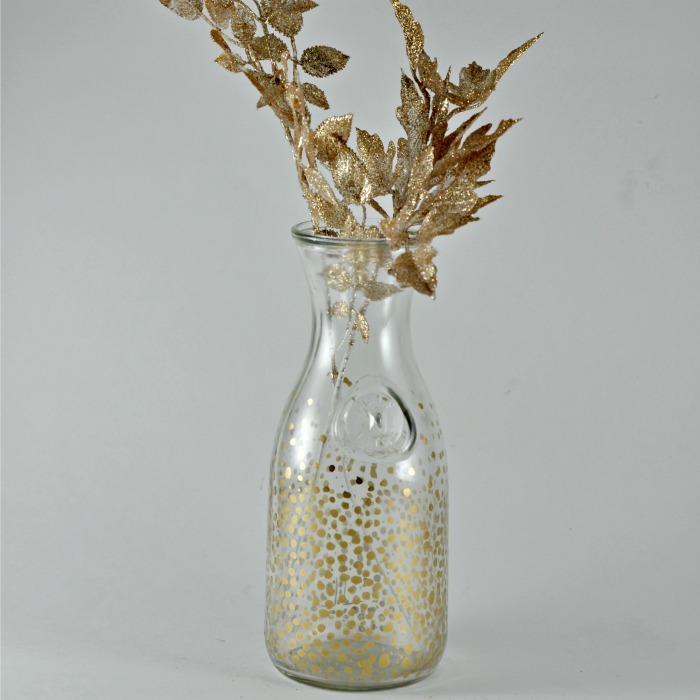 Thank you Modern Masters and Looksi, for helping me to add a bit of antique glam to these mason jars. Mason jars are such a popular decor item these days. 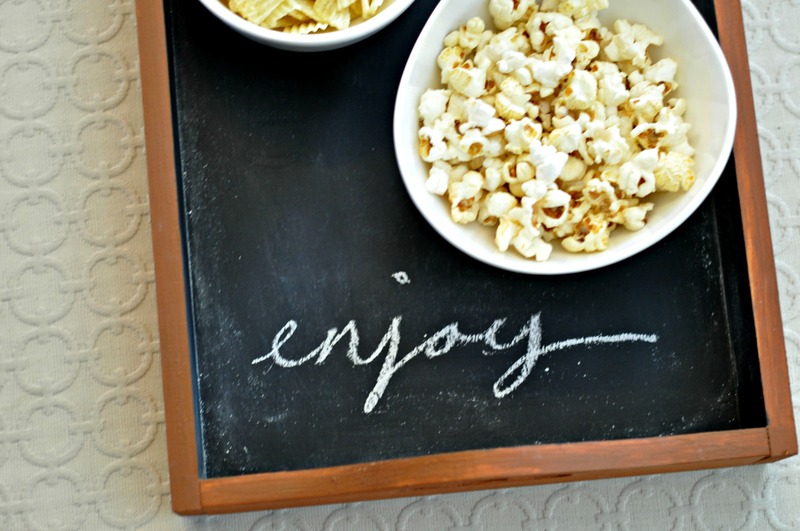 Not only are they cheap, but they’re super easy to personalize and slip into decor. 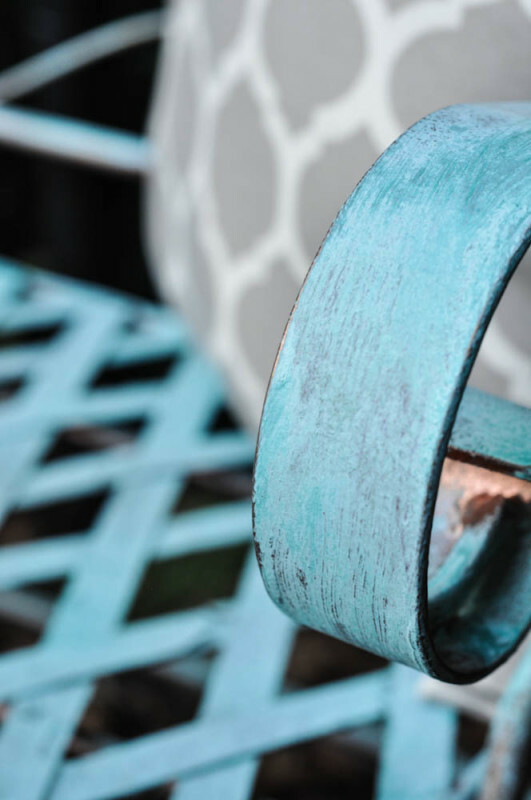 When I was working on my metal bench makeover, I suddenly had a brainstorm. If I could age metal… why couldn’t I age glass? I collected some mason jars from my stash. Sorry for the terrible picture. I guess all “Before” pictures need to look a bit grotty and out of focus. It helps to make the “after” that much more appealing, doesn’t it? I showed the different steps of paint in my bench makeover, but the mason jars are just as simple. I applied two coats of Modern Masters Metal Primer, and then one coat of the Metal Effects Copper paint. When I was applying the second coat of paint on top of the now-dry first coat, I broke out the magic solution. ‘Scuse the paint everywhere… creativity sometimes lends itself to a bit of mess. 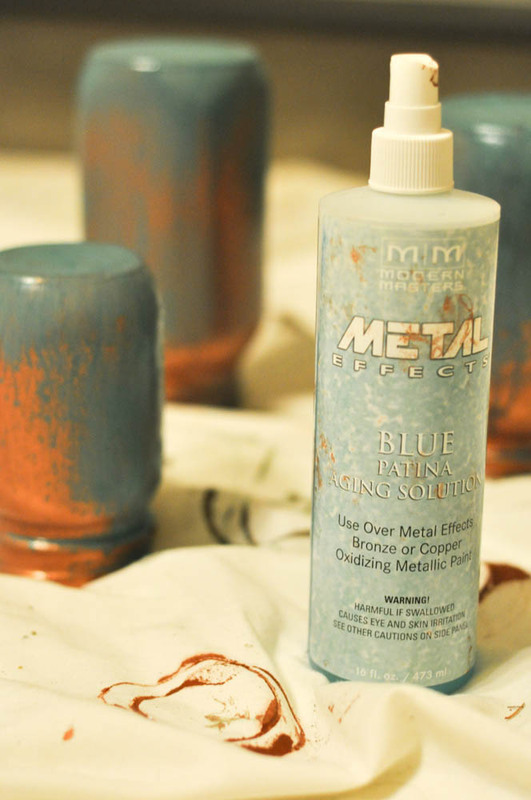 This is the Metal Effects Blue Patina aging solution. It is applied to the still-wet paint. I opted to put the little sprayer on the bottle and apply it that way. The directions say that you can sponge it on as well, but I like the way that the spray adds a bit more of a random look. Plus, I find that the patina gets much darker in the crevices, which is exactly how it would age naturally. If mason jars were metal. But let’s suspend reality, people. 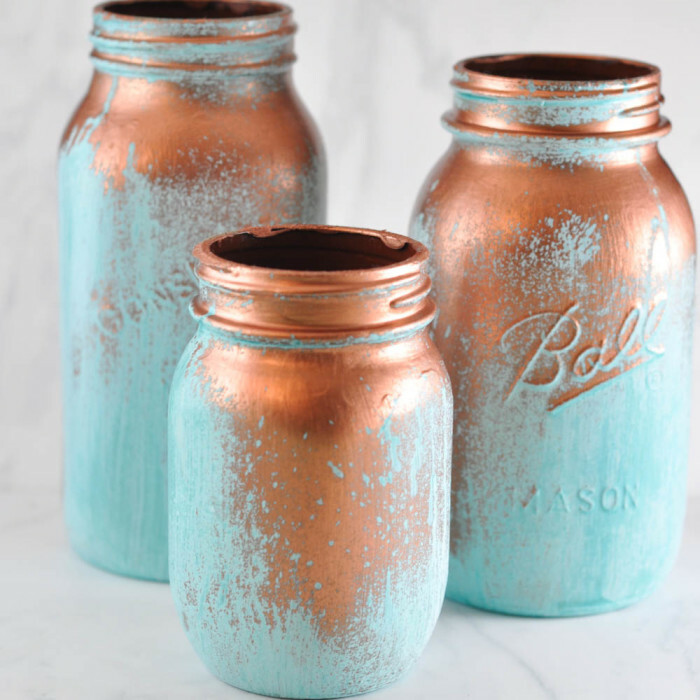 I love the idea of a metal mason jar. 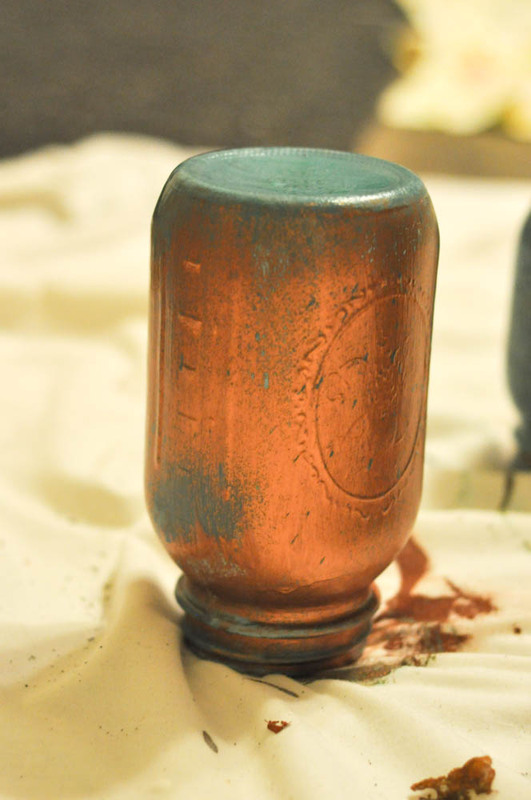 After about three or four minutes, the patina solution will start to change the copper paint into a nice dark blue colour. I admit, I hovered over these jars, and willed them to change colours. I also opted to spray the patina while they were upside down, because I wanted the bottoms to be changed as well. For some reason, I had a feeling that this would look the best. And I feel like I was right. Now dry, the patina solution is a gorgeous bluey-green. I really like that a large portion of the copper is still visible. It adds contrast, and also make the aging of the mason jars look more authentic, I think. Would you have sprayed the entire jar? Tell me what you think. I have lots of paint left over, and my mason jar collection runneth over! See more of Modern Masters’ paint achievements on their website and their Pinterest board. 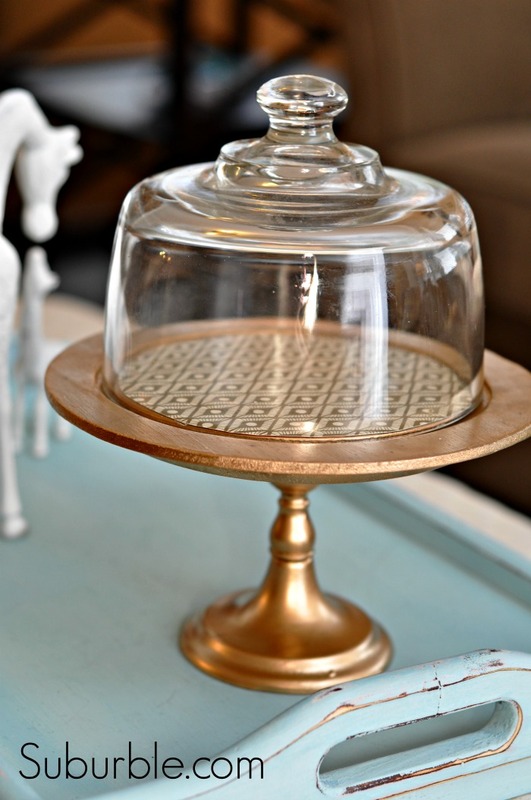 A Cheese Plate Turned Into A Cloche! I’ve thrown my hat into the ring for the East Coast Creative’s Creating With The Stars Contest! Let’s see what these mason jars can do! WOW–what a stunning look. 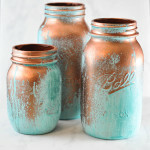 I would have never though to give mason jars a patina finish! Love it! 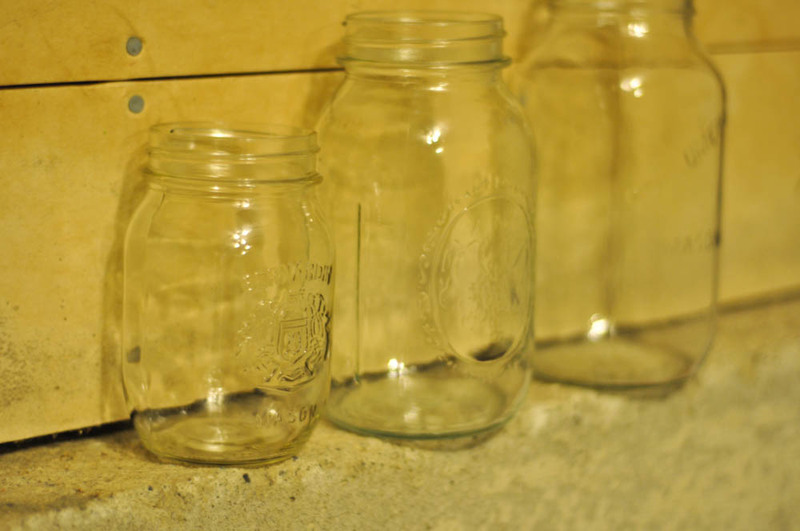 Turns out – I was just as thrilled with the jars as I was with the bench! These turned out great. Love the colours. Thanks for the great project idea. Thank you so much, Dannyelle! The colours are great, aren’t they? I’m a sucker for blue these days. Where in the world do you buy this paint?! I need to get some in my life. Stat. Jess, you actually get it from Modern Masters – http://www.modernmasters.com. They have this crazy paint (the copper paint) that is reactive. So if you spray the patina solution (or there’s a rust activator solution) on top of the wet paint, it will create fantastic aged looks (but in minutes!). Ohh… thank you, Peggy! Your word choice speaks to my heart! Oh they’re really nice, love that effect. Thank you so much, Mel! It’s so different, isn’t it? I love it! So pretty! I love how they turned out. The blue with the metallic is gorgeous. And how creative of you to try this on glass! Thank you so much, Steph! I was thrilled with how well they turned out! Okay, honestly… my heart skips a beat every time I see these. Where did you buy the paint kit? This is the Copper metallic paint with the blue patina solution. You’d need the primer and the spray cap too. All in all, it should be less than $30 for all of it (and you’d have HEAPS leftover). Let me know if you can’t find it anywhere – there is a retailers button on the site for Canadian locations. Wow! I’ve never heard of that type of paint, but I will definitely be checking it out!! It looks awesome! I love the look of it on the mason jars…beautiful!! Tara. Seriously gorgeous. And I heart your grotty out of focusness. LOVE these! These have to be about the prettiest jars I’ve seen in a long time. They are GORGEOUS! I love these jars! I’ve been planning some re-purpose projects for some of my thrift shop finds and this is exactly the sort of thing I hope to do. Thanks for the inspiration! Thank you, Kim! If you try this, I’d love to see your pictures! I love this! I had no idea that it was a reaction and not different paint colors. 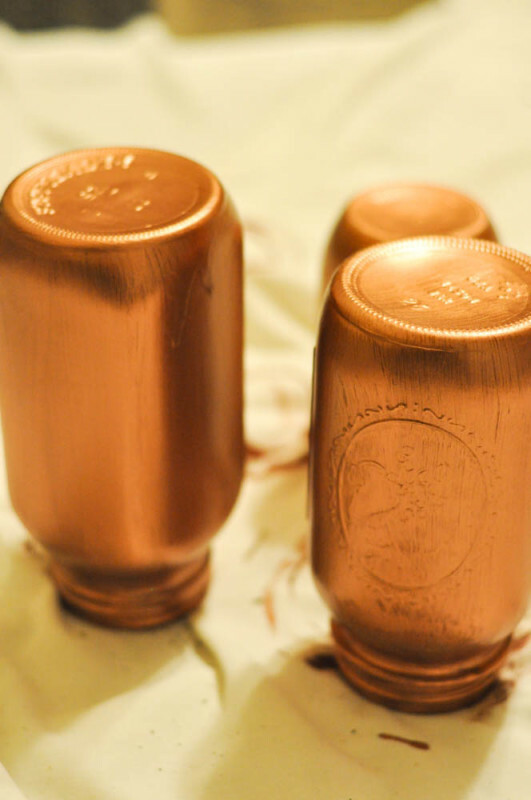 I just bought myself some liquid copper leaf and am totally excited to paint it on everything! I wonder if I could get the same effect on copper leaf. I guess I will have to do more searching. 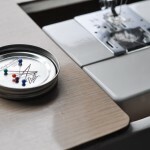 Thanks for the inspiring project! 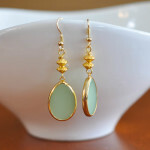 These are SO SUPER CUTE! I can’t wait to make my own!!! Featuring these in my favorite finds tomorrow morning 🙂 Have a lovely weekend Tara! Thank you SO much Kristi! I love it when anything of mine gets a bit of limelight. These jars were such a great project to make. Let me know if you ever tackle them yourself! I’ve wanted a copper mailbox forever but they are around $500. I think this is just the resolution! Thank you! Oh, let me know if you try this out, Vicky! The metallic paints from Modern Masters will definitely give you that effect. Do you think if I used a silver metal spray instead of copper that the blue patina will still come out the same? Do you have a reactive paint, Ashley? I used a paint that reacted to the spray that I used. Let me know what you’re working with and I’ll see if I can help. 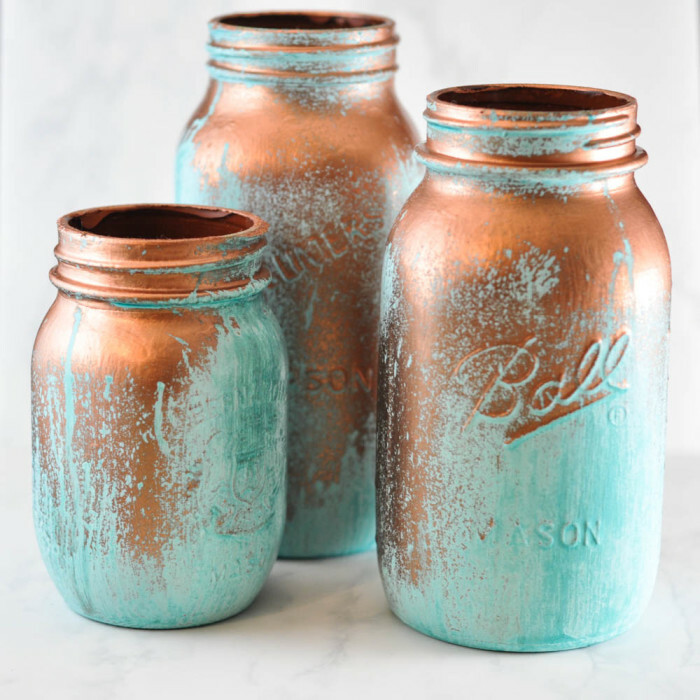 So FYI this doesn’t work if you don’t get the metal effects brand of blue patina, but I played around with what I did get and made some awesome “metal” mason jars, so thanks for the inspiration. Hi Cassandra – in this instance, it’s a good idea in order to get the reactive paint to stick to the glass. I haven’t ever tried it without. I love these! I’ve been playing with different acrylics and getting a combined color look. It was a bit tricky and stinky the last time though (tried to speed up the drying-not a good idea). Anyway I am wondering what the majic solution is?